Kenya's public prosecutor has ordered police to investigate the cause of a dam break that killed at least 44 and left thousands more homeless. Local media reported that the privately-owned dam was illegal. Kenya's chief prosecutor called Friday for police to investigate a dam break in the Rift Valley that sent water and silt gushing downhill into nearby towns on Wednesday evening, killing at least 44 and leaving 40 more missing with search and rescue operations ongoing. The dam burst, which took place on the Patel coffee estates farm in the town of Solai, followed weeks of heavy rain that have also unleashed deadly mudslides and flooding across much of East Africa. A spokeswoman for the Water Resources Management Authority, Elizabeth Luvonga, which oversees private dams, said other reservoirs on Patel’s Farm in Solai, 190 km (120 miles) northwest of Nairobi, also lacked the necessary documents and were illegal. Simon Chelugui, the Water and Sanitation Minister said the burst dam and others on the property did not meet regulations, and that the Water Resources Authority had been pursuing the owner to make them compliant. He ordered all the others to be drained as a precaution. "I hereby direct that investigations be conducted and a file of the investigation report forwarded to the [Director of Public Prosecution's] office in 14 days, for perusal and appropriate action," Noordin Haji, the director of public prosecutions, said in a statement, according to Kenyan newspaper Daily Nation. The dam that burst and others on the same farm had not been licensed by government engineers, the paper also reported. The manager of the Patel coffee estates, Vinod Jaykumar, told Kenyan media outlet Citizen TV on Thursday that the incident was the result of a natural disaster. Solai is located in Kenya's fertile Rift Valley, some 190 kilometers (120 miles) northwest of the capital Nairobi. Government officials and witnesses described scenes of massive destruction in the immediate aftermath of the dam break, with water sweeping away entire villages. "The water has caused huge destruction of both life and property. The extent of the damage has yet to be ascertained," said Lee Kinyanjui, governor of Nakuru, the county where the dam is located. "We have set up a center near the scene for families to report missing members to enable us to reunite them," Kinyanjui added. He told Kenyan broadcaster KTN that emergency efforts included providing food and material provisions like blankets and clothes to those affected, many of whom are low income families, as well as psychological assistance. Kibunjah described the dam as a disaster: "Most people were asleep when the tragedy occurred and their houses were swept away," he said in remarks to AFP. Survivors described a "sea of water" that swept away powerlines, homes and buildings, including a primary school. Witness told the Daily Nation that they heard an "explosion" before water and mud poured out, sweeping away hundreds of homes. Officials said the damage radius extended nearly two kilometers. The paper reported that the burst dam left over 500 families homeless and affected around 2,500 residents. Heavy rain has battered Kenya and other East African nations over the past two months. The rains have killed at least 132 Kenyans and displaced over 222,000, government statistics released Wednesday said. The Patel dam is one of three dams in the area. The other two have high volumes of water, but remain intact, the Daily Nation said. Kenya's Cabinet Secretary for the Interior, Fred Matiangi, arrived in Solai on Thursday to review the damage. He pledged central government assistance in dealing with the disaster. On Friday, government engineers started letting water out of two of the other Patel dams, according to a statement from the local governor. Nakuru county, where Solai is located, lies in Kenya's fertile Rift Valley where thousands of commercial farms produce agricultural exports for Europe. Irrigation resevoirs dot the area. Residents fear that other dams may burst. Authorities ordered the evacuation of six more cities in Khuzestan province after more rain sparked fears of new flooding. Heavy rains since March have caused the worst flooding in 100 years across two-thirds of Iran. 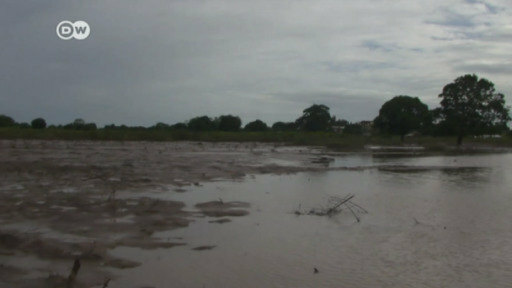 "Once-in-a-century" flooding in Australia's tropical northeast has forced thousands of people to leave their homes. Forecasters have also warned that more rain and thunderstorms are on the way.